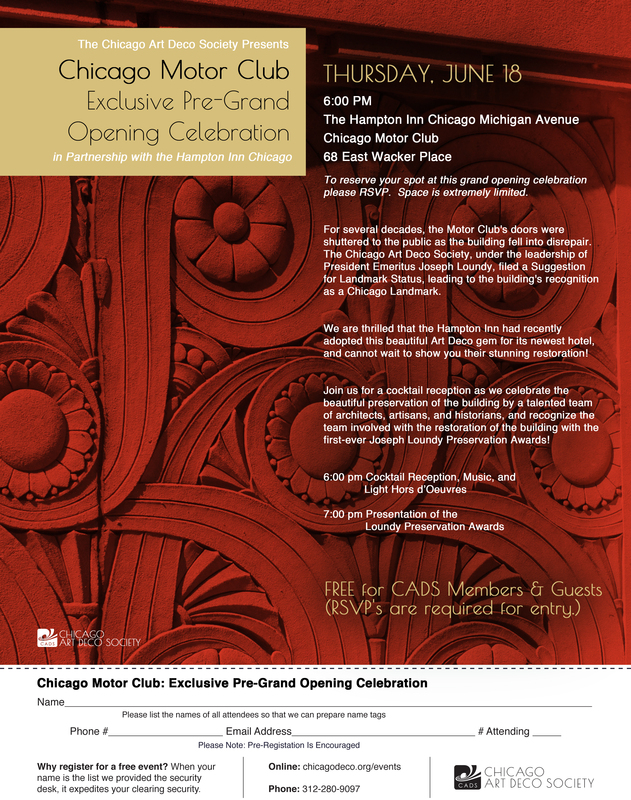 To reserve your spot at this Pre-Grand Opening Celebration please RSVP. Space is extremely limited. For several decades, the Motor Club's doors were shuttered to the public as the building fell into disrepair. The Chicago Art Deco Society, under the leadership of President Emeritus Joseph Loundy, filed a Suggestion for Landmark Status, leading to the building's recognition as a Chicago Landmark. We are thrilled that the Hampton Inn had recently adopted this beautiful Art Deco gem for its newest hotel, and cannot wait to show you their stunning restoration! Join us for a cocktail reception as we celebrate the beautiful preservation of the building by a talented team of architects, artisans, and historians, and recognize the team involved with the restoration of the building with the first-ever Joseph Loundy Preservation Awards!